Owner of ADEX Club Don Giafardino showcases a workout utilizing a club front swing and a one-hand halo. In the video, Don is using an ADEX Adjustable Club that can be utilized with both exercises, and transitioned into a heavier or lighter weight. During the front swing, keep the spine long and focus on loading the glutes and hamstrings during the hip hinge. It’s important to note that in this exercise we are utilizing a hip hinge and not a squat. During the swing, try to have your arms long and swing no higher than eye level. With an ADEX Club you can adjust your weight during your rest period. If utilizing another club, have it handy to transition to and give yourself the appropriate amount of rest. Once transitioned to the one hang halo, start in a ready position with the core braced. Drop the weight over your opposite shoulder and come back to your starting position with the elbow in a 90-degree angle. Owner of ADEX Club, Don Giafardino, shows an effective upper body workout using one weighted club. All sets have a one-minute rest time AFTER both the right and left movements have been performed. Clubs are a beautiful way to strengthen and develop power throughout the body while increasing cognitive awareness. Train as if you were training with a weapon for battle. Perform crisp clean movements, keeping shoulders packed down and good posture. Steel Mace HIIT Training can be a welcome alternative to the endless Stairmaster, Treadmill, or Running Cardio Sessions – which are good but if you really want to eliminate some body fat get into HIIT Training with Steel Clubs or Steel Maces. It’s like running for your upper body, well, almost and Done in 20 Minutes!! If you’re like me and don’t have the interest to run for long distances but would like a Challenging, Simple, 1 Exercise Cardio or MetCon Workout look no further – Steel Clubs and Maces Can Do That For You! This workout is based on a Steel Mace 10 to 2 or a Steel Club Halo/Shield Cast. 1 Exercise. 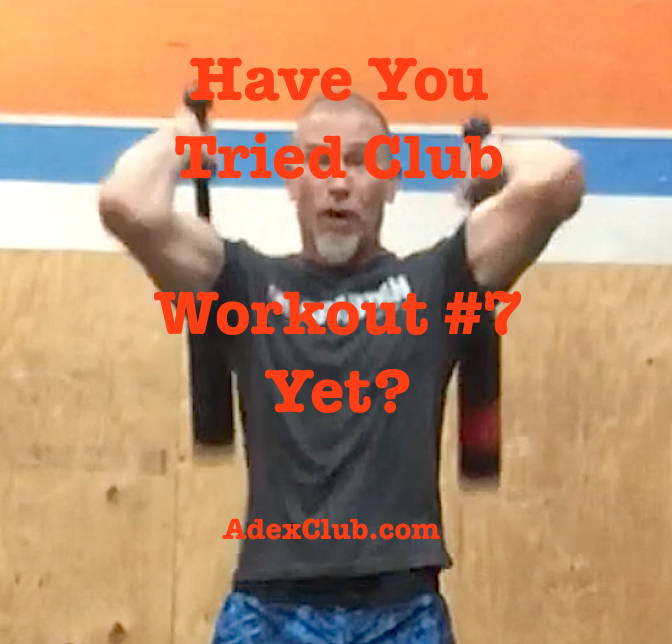 Here is an at-home or at the gym workout your can do with your ADEX Club and/or Mace. Switching Gears and heading back into the Heavier Club and Mace Training. The workouts will have Numbered Titles to make easy reference to them. These next few weeks of workouts are going to be a combination of heavy, more complete body workouts with some new adaptations to keep the mind/body connection. You can Perform This Workout with Single or Double Clubs. Follow along beginning with Today’s Club and Mace Training. Stay Safe – Be sure to keep good posture, shoulders pressed downward toward the rear pockets, and use a weight that is challenging yet still allowing for good form. Be sure your training area is clear and free of anything including other people and pets. Train hard. Train Smart. This is a timed workout and can be used as a benchmark to test progress throughout the year – we will discuss this in a future workout blog post and why it is imperative to use consistent metrics when tracking athletic ability. Please share these workouts with your friends or clients. Thanks!